I hadn't originally intended to make my 2016 Favourites into a two parter but when I found what is now Part 1 taking on a long life of it's own I decided to carry on today with the eyes and the lips. 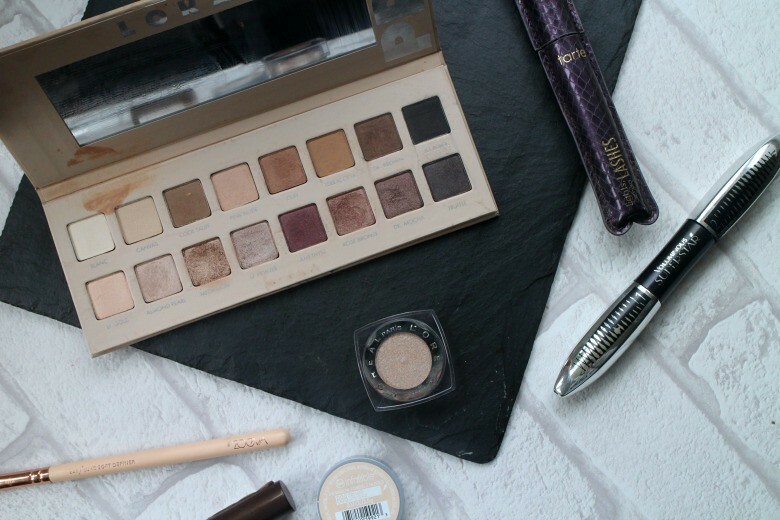 Lorac Pro Palettes are well known in blog circles and they are still one of the now few US releases that are difficult to get hold of in the UK, and even if you're lucky enough to head to the US tracking down an Ulta that have them in stock is your next problem. I'm lucky to have a US Beauty mule in the form of my friend Rose who placed an order for me and shipped it over and I'm so thankful she did. On first impressions I thought the Lorac Pro Palette 3 was a little disappointing compared to Lorac Palettes 1 and 2 which I also have. Was this palette just a little too neutral and boring for even little old me who is not skilled with eye make up. The answer is not at all and this is a palette I reach for, and have reached for on an almost daily basis. So much is the love that I'm due to embark on a declutter of my make up and think it's time to part ways with some of my eyeshadows that are left behind and unloved. One eyeshadow range I will not be parting with are my small, but growing collection of L'Oreal Infallible eyeshadows. I first picked up Amber Rush and Bronze Taupe in the US during ravings years ago and since then Amber Rush, a US exclusive at the time although it seems the range has been discontinued in the UK completely now, has appear in favourites posts for March and June last year. These pressed pigments are amazing and really pigmented and one of the few ranges with some shimmer that work with 'older eyelids'. I added another couple to my collection in October when I visited Las Vegas with Iced Latte the pictured shade and a favourite during December. This in particularly is apparently a dupe for Urban Decay Kitten which I can neither confirm nor deny but I can tell you its a wonderful shade that worked perfectly over the festive season. Interestingly I have found myself neglecting my favourite Mac 217 of late for the Zoeva 227 Brush*. I find this softer than the 217 and therefore easier for blending and creating the look with my unskilled hand. I still of course have love for the 217 and it's still the product I always treat myself to in Duty Free but I think it's time to add a few more 227 to the mix. Finally it's the brows. I know brows have been big and I should really be singing the praises of various brow pomades and the like, which I do use but it's the L'Oreal Brow Artist Plumper that I've reached for this year. 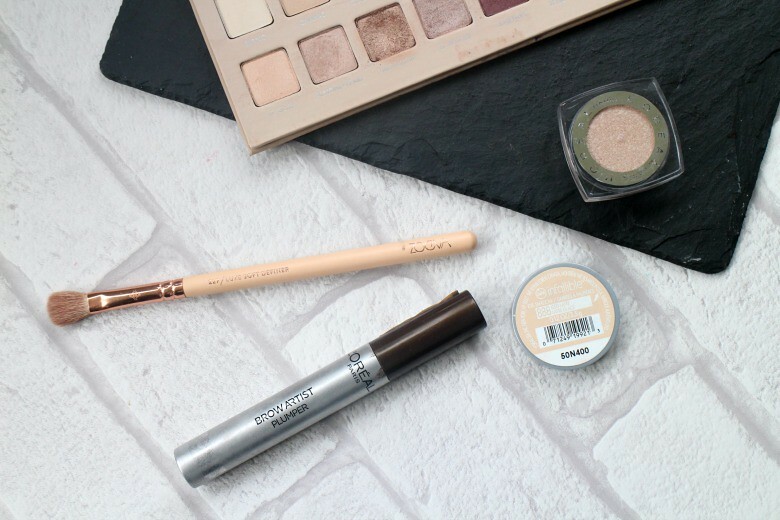 Taking the place of my previous favourite, Maybelline's Brow Drama the L'Oreal addition to the line up of such products has a much more appropriate brush to work with. I have dark and thick brows so I find a sweep of this product is sufficient for 'every day make up' looks. Yes if I'm putting more effort in I'll reach for products such as the Anastasia Brow Wiz but it's not something I favour working with. I've tried to work through my mascara stash during 2016 but the favourite product which has already been repurchased on two occasions and heading for it's third purchase is the Tarte Lights Camera Lashes. I'm tempted with the duo available on QVC such is my love although I've just seen there is one available with a bottom lash mascara which is very temping to try as I've been applying mascara to my bottom lashes more often than I have previously. This is one of few mascaras that I find gives my lashes that false lash effect and doesn't have any fall out. If I have a long night ahead this is what I'll reach for. That said a good competitor is the L'Oreal False Lash Superstar Red Carpet Mascara which isn't as good but at a drugstore price it hits the spot. I'm even more tempted to try the Superstar X Fibre version which has been released recently as it offers a black primer as opposed to the formers white. I don't find any issue with the white but I wonder if the black improves things. If you've tried both I'd love to hear your thoughts. As I enter 2017 I do want to address my make up collection and lipsticks is one of those areas where I have certain favourites and therefore wonder why I have so many others. Here are some picks which have been in steady rotation starting with the KIKO Impressionist Red* which was part of The Artist Collection. 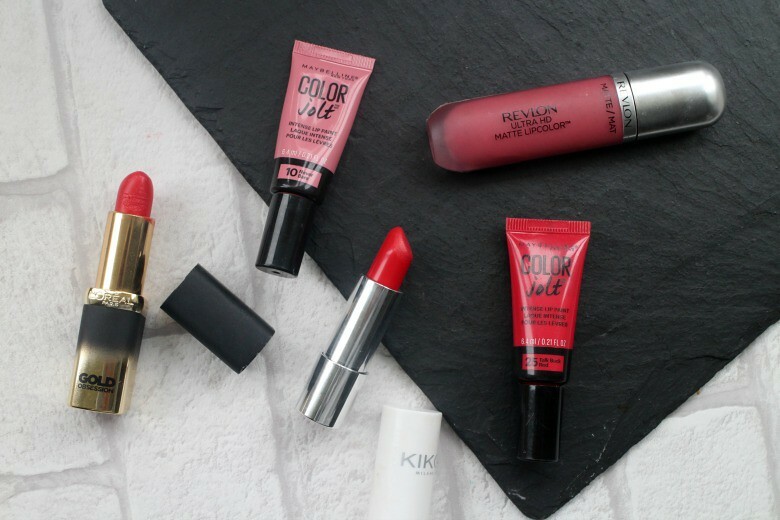 This is the perfect red for Summer and one I took on holiday with me loving it's staying power and creamy formula that does not dry out lips. I've only tried two lipsticks from KIKO and this collection but I would be interested in trying more based on this foray. I'll also give special mention to the complimenting lip liners which work just as well on their own if you're looking for a more matte look. 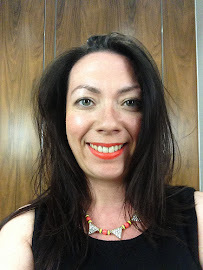 Revlon Ultra HD Matte Lip in Devotion has fallen out of favour recently but was a lip product I'd often reach for on working days when I didn't want to think about my make up too much nor worry about keeping a red shade topped up. For a matte lip they are not drying at all and if you're a fan of Rimmel East End Snob Liner (which is another favourite I recently finished) you'll love this. A more recent favourite has been the L'Oreal Gold Obsession Lipstick in Rouge Gold. This is a wonderful shade of red shot through with a gold that adds a shimmer you don't often find in a red but doesn't give off an old fashion glittery look. I have travelled with this shade as I find it works well for as a red for all seasons thanks to the 'hidden gold' element. Finally for lip favourites are the Maybelline Color Jolts or Paints depending where you are in the world. Mine have come from the US and the shade names certainly vary. These aren't the longest lasting lip products but they last longer than I expect for a product of it's type and I like the ease of which they're applied. I do fear their size and my usage means these will be used up very quickly. Finally the products that finish off any make up look. I've used some artistic licence and have photographed the Maybelline Setting Spray when it has been the L'Oreal Fixing Mist I have in fact used and recently made its way to the empties pile. That said both my versions which were picked up in the US, and again I believe are different from the UK equivalents do have the same ingredients so I assume they are one and the same bar branding. I was unsure how I felt about setting sprays and how much of a difference they make but they sit on my dressing table and I give a spritz before walking out the door. 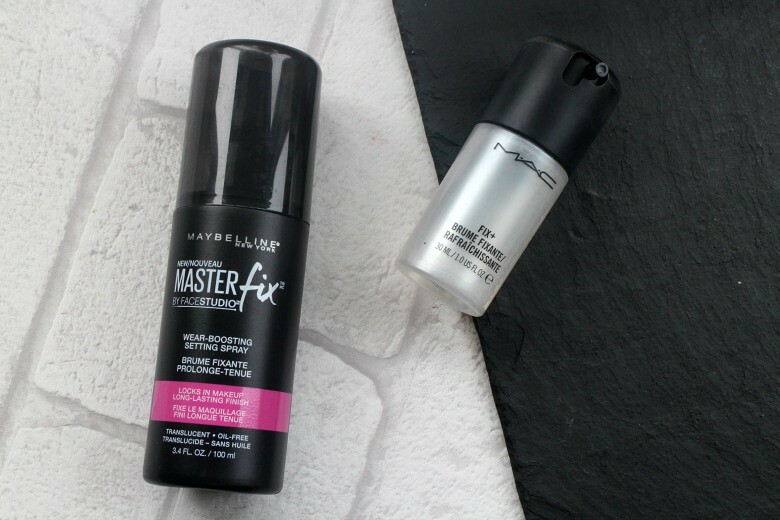 Mac Fix Plus has made more of an impact that latter half of the year about seeing Laura discussing the various ways she's been using and I've adopted one or two myself. I've gone so far as pop this handy travel size into my make up bag and it really does perk up the skin on a long day. I feel this could be a staple for 2017. That brings a close of my make up favourites in 2016, don't forget to give Part 1 a read if you haven't already done so and do share your favourites for the past year and any thoughts you have on my picks. Victoria, great post!! I love those colors of eyeshadows!! They are all the colors I wear. I know I cannot understand why they have and the US have such a selection of shades. They're so good I'm just trying to buy whilst I can in case the US discontinues them too.